Kakuta Kakuji (Kakuda Kakuji) was a rear admiral in command of Carrier Division 4 at the start of the Pacific war. This unit of light carriers provided air support for landings at Davao in the southern Philippines. Kakuta's task force subsequently conducted secondary raids on the east coast of India during Nagumo's raid on the British bases at Ceylon. During the Midway operation, Kakuta conducted raids against Dutch Harbor in the Aleutians. The raids went well enough, considering the terrible weather, but the Japanese unknowingly suffered an intelligence disaster when a Zero crashed almost intact and was recovered, repaired, and test-flown by the Americans. Kakuta's division, now renamed Carrier Division 2 and reinforced with the Hiyo, participated in the Japanese naval victory at Santa Cruz. Later, his carriers were stripped of their air groups, which participated in I-Go, the Japanese antishipping campaign in the Solomons. Kakuta then rushed to the Aleutians to provide cover for attempts to reinforce Attu and Kiska. 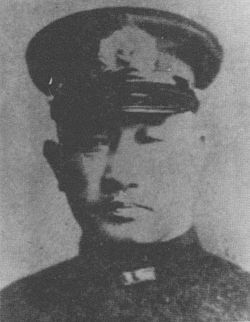 By mid-1943, following the death of Yamamoto, the new Combined Fleet commander, Koga Mineichi, adopted the American carrier task force concept. Kakuta was promoted to vice admiral and given command of 1 Air Fleet, the land-based anvil against which 1 Mobile Fleet was to be the hammer. Time was short, and Kakuta supported the decision to send new pilots to carriers before they had received advanced combat training. He justified this on the grounds that he was getting the best 20% of the trainees, that they would not have to shake off any bad habits, and that they could learn on the job. Operational losses and fuel expenditures both rose. 1 Air Fleet was thoroughly worked over by American carrier raids in February 1944. The fleet was still trying to rebuild when the Americans returned with an invasion force in June, and 1 Air Fleet suffered massive losses and was unable to play a decisive role in the Battle of the Philippine Sea. Kakuta compounded this failure by failing to be candid in his reports to Toyoda, leaving Ozawa with the impression that Japanese land-based air was still capable of supporting his fleet. Kakuta likely committed suicide with the fall of Saipan after failing in an attempt to evacuate his headquarters by submarine. I will make a charge with all forces under my command. All confidential documents have been destroyed. This may be my last communication. Kakuta was a stout man standing over six feet (180 cm) tall. Leckie (1962) describes him as "a coward and a drunk" who "could not more command than he could stop swilling saki or scheming for his own safety."